Alain Badiou doesn't mess around. As an advocate of direct action, contre "capitalo-parliamentarism", he has pledged to reward his nastier critics (largely idiots like BHL) with a slap whenever he sees them. These opponents, with their accusations of antisemitism and fascism, were responding to the publication of his book 'Polemics' (in French, 'Circonstances 3') and the more recent 'The Meaning of Sarkozy' ('De quoi Sarkozy, est-il nom?'). The latter is less about the "fidgety mayor of Neuilly", or "the Rat Man", than about what Sarkozy's ascendancy says of the vacuity of the electoral process. 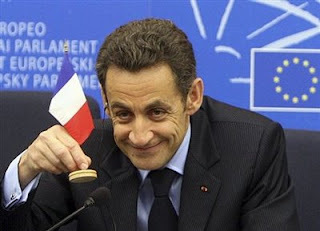 Sarkozy himself is important only inasmuch as he embodies the spirit of reaction, even if it is a dwarfish embodiment compared to the Thermidoreans, the Orléanists, the Versaillais, Pétain and even d'Estaing. The book is a curious mixture of political philosophy and acuminated satire. I had never thought of Badiou as an especially funny man before, but - as is so often the case - it is because he is so serious that his satire is so lethal. Through a series of essays and lectures, he takes the occasion of Sarkozy's election victory and subsequent travailles to subject parliamentary democracy to an acerbic critique - and behind all of this witty and indomitable polemicising lurks the shade of communism. According to Badiou, the French Left (and by extension, the Left as such) has practised a reactive politics based on fear of the right, which in turn is essentially mobilised by the fear of the leftist challenge. At the same time, the politicians of the reformist left flaunt their impotence, their inability to transform affairs, and cling to it. All they can do is keep the right out of office and limit the reaction. Then Sarkozy wins, and Socialists - many from the generation of the nouveau philosophes - flock to join his administration, or be part of the clique. Sarkozy expresses his 'openness' to the left, the better to coopt its luminaries for the creation of a technocratic single-party state (this is what the language of bipartisanship always boils down to) and form what Badiou calls a Union for Presidential Unanimity (a pun on the name of Sarkozy's party, the Union for a Popular Movement). This is the state that neoliberal capitalism has reduced politics to. As Badiou says, quoting Zizek, those who used to oppose parliamentary democracy to Stalinism missed the point that Stalinism was the future of parliamentary democracy. Indeed, "the technological means for controlling the population are already such that Stalin, with his endless handwritten files, his mass executions, his spies with hats, his gigantic lice-ridden camps and bestial tortures, appears like an amateur from another age". And how many times have you heard pundits boasting about the big turnout for a particular election? Boast they must, because it is happening with less and less frequency these days. But what does this say about voting, as an act? What matters, apparently is that people participate, and thus give the system a democratic imprimatur. Badiou's conclusion is different. Observing the heralds of Sarkozysme ratify the new administration with its engorged turnout, he retorts: "If numbers alone are a cause for celebration, then this means that democracy is strictly indifferent to any content". If people vote for a mediocre clerk, then "all glory to them! By their stupid number, they brought the triumph of democracy". The bards of parliamentarism are "more 'respectful' than I am of the 'popular will', even when they see it as idiotic and dangerous. Bow down before the numbers!" Beyond which caustic banter lies the humane purpose of defending migrant workers, upholding the hippocratic principle, supporting creative art, putting emancipatory politics before managerial necessitarianism, and ultimately restoring the 'communist hypothesis' to its proper place. Said hypothesis, which is that the system of classes can be overthrown, is a "real point" to hold onto against the alternative hypothesis of parliamentarist impotence. Those who reject the communist hypothesis are bound to market economics and parliamentary democracy, and therefore to the very logic that leads to the Rat Man. You could wish that Badiou would not say 'democracy' when he means 'parliamentary democracy', or that he would not say 'left' when he means something much more ambiguous (is Ségolène Royal really in any meaningful sense on the Left? Or Bernard Kouchner for that matter?). But the provocative, ludic manner of the collection is part of its charm. It is because Badiou doesn't respect the rules of the 'capitalo-parliamentarist' game that even his ultra-left tendencies - an overhang from his wild Maoist days - become the basis for important insights.